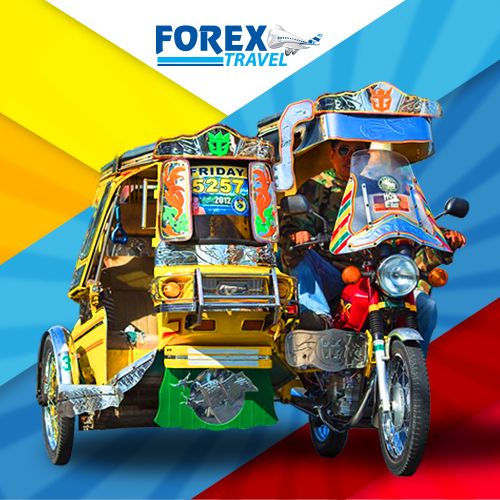 When travelling to the Philippines, one of the most popular mode of transportation is the Tricycle. A Motorcycle with sidecar attached for passengers. These versatile colourful mini public utility vehicles either run through a set route or a for-hire like taxis. It is the most popular means of transportion epecially where the roads are too narrow for Taxis, Buses and Cars. Originated from the military tricycles that were left by the Americans during the Second World War, much like the more popular Filipino Transportation, the Jeepney. The tricycle indeed was made with Filipino ingenuity and out of necessity as the country needed a mode of transportation. These modified military tricycles instantly help solve the transportation problem in the Philippines. Hop on a Tricycle from your local TODA (Tricycle Operators and Drivers Associations) in the Philippines, the King of the Alley-ways, while exploring the different sights and sceneries across the beautiful island nation of the Philippines.